Expect visible results, even for those hard to treat areas – neck, upper lip and around the eyes. You’ll immediately see the results giving an overall younger look. Pollogen Divine treatments are safe and effective with no pain and no downtime. Pollogen Divine includes two cliniclly proven technologies that achieve visible skin renewal. The use of micro-neddles with radio frequency technology triggers the body’s natural healing response mechanism thus stimulating the body to naturally produce hyaluronic acid, new collogen and elastin. TriFractional RF energy rejuvenates the outer epidermis layer. This minimally invasive treatment creates micro-wounds which trigger the body’s natural healing response mechanism. Old and damaged skin cells are removed and the body produces new and healthy skin. VoluDerm provides a safe and effective penetration of the epidermis for controlled heating targeting deep dermis. This minimally invasive treatment uses fine micro-needles while applying RF to volumize the deep dermal layer. The micro-needles stimulate the body to naturally produce hyaluronic acid, new collagen and elastin. TriPollar with Dynamic Muscle Activation (DMA), the only non-invasive technology which uses radio frequency energy to generate heat through resistance in both the dermal and subcutaneous layers causing collagen fibers to contract. This creates an immediate skin tightening effect. Increased fibroblast activity results in collagen regeneration for a long term effect. Dynamic Muscle Activation energy stimulates the facial muscles resulting in lifting and toning of the SMAS. DMA accelerates lymphatic drainage, blood and lymph circulation optimizing tissue oxygenation and detoxification. VoluDerm HE is a minimally invasive solution that uses ﬁne micro-pins combined with radio-frequency to gently ablate the epidermis and heat the deeper dermis layer. The micro-pins stimulate the body to naturally produce hyaluronic acid, new collagen and elastin. The result is signiﬁcant with long-term dermal volumizing, wrinkle reduction and skin resurfacing. How does TriPollar with DMA technology work; TriPollar is a third generation radio-frequency (RF) technology for non-invasive facial and body contouring. DMA stimulates the SMAS resulting in lifting and toning the facial muscles. It generates the RF current between three or more electrodes and focuses the energy to the treatment area only. As a result, TriPollar RF with DMA delivers immediate and long-term skin tightening it works concurrently on the dermis, hypodermis (fat) and muscle layers to noninvasively deliver superior fat cell reduction. TriFractional enables effective fractional skin resurfacing and is suitable for enhancing the Hybrid Energy treatment. TriFractional energy creates micro wounds which trigger the body’s natural healing response mechanism, inducing neocollagenesis to create healthy skin tissue. Each complete TriFractional application is comprised of three sequential pulses which enables the RF energy to penetrate the tissue comfortably, without overheating. Like the multidimensional nature of the ancient pyramids, this combination of treatments come together to create an impressive aesthetic result. 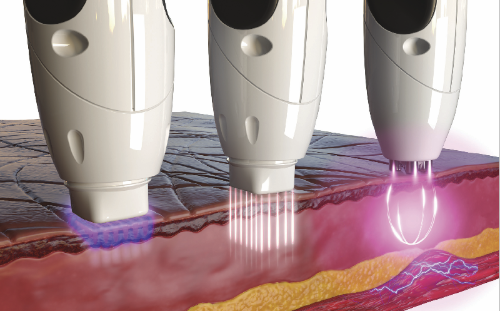 The minimally invasive treatment combines the technologies of VoluDerm, TriFractional RF and TriPollar with DMA (Dynamic Muscle Activation) and offers six beneﬁts. Treatment plan: One every 2 weeks once the skin has healed and ready to proceed with the next session for up to two sessions. Two technologies used at the same time as layered technology. VoluDerm provides a safe and effective penetration of the epidermis for controlled heating targeting deep dermis. This minimally invasive treatment uses ﬁne micro-needles while applying radio frequency to volumise the deep dermal layer. The micro-needles stimulate the body to naturally produce hyaluronic acid, new collagen and elastin. Treatment plan: One every 7-10 days once skin has healed and ready to proceed with next session for up to 3-4 sessions..
Two technologies used at the same time as layered technologies. TriFractional radio frequency energy rejuvenated the outer epidermis layer. This minimally invasive treatment triggers the body’s natural healing response mechanism. Treatment plan: One every 2 weeks once the skin has healed and ready to proceed with next session for up to 3-4 sessions. An advanced non-surgical facelift using patented TriPollar radio frequency technology to stimulate and contour the face by producing natural collagen and elastin in the skin to tighten and tone to improve elasticity, reduce and soften the appearance of ﬁne lines and wrinkle, plus aid in reducing crow’s feet and pufﬁness around the eye area. This anti-ageing facial is non-invasive providing rejuvenating skin results that will last for up two years. 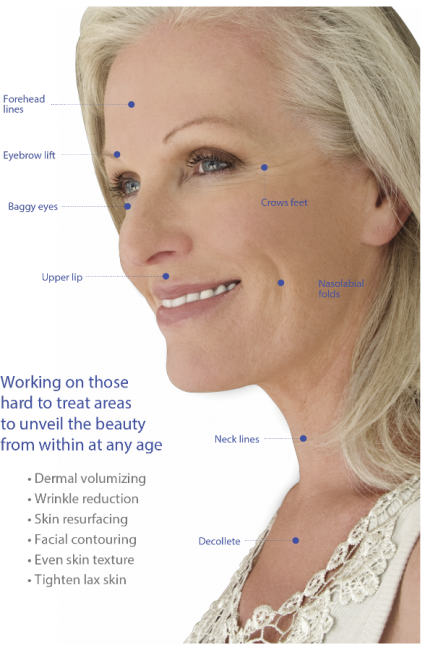 Your non-surgical alternative to anti-wrinkle injectables. Treatment plan: One every 7 days.